In the landscape of Inuit carvings, those of Maudie Ohiktook stand out with a distinctive style all their own. Maudie was born on New Year’s Day at Thom Bay in 1944, but it was her move to Spence Bay in her early twenties that began her carving career. Among the first in her community to take up carving, the main materials used were stone and whale bone. Bone remains a popular carving material in Taoloyoak due to the region’s lack of nearby quarries; however Maudie often prefers to carve in stone, particularly serpentine and steatite. Maudie was also married to the gifted carver, the late James Ohiktook. They learned the craft together, and would often guide and critique each other as they went. At one point, Maudie’s love of carving began to fade, however with James’ encouragement (and luckily for us), she persevered, and continued to carve, for which she credits her late husband. Much of Maudie’s work features spirits, shamanic transformations and other animals, often in the mid-stages of transformation between two or more animals. One of her other preferred subjects are female subjects, from the daily lives of mothers to the supernatural shamans and mythical Sedna. There is a gentle nature to her carvings that makes them charmingly whimsical, and truly memorable for any admirer. 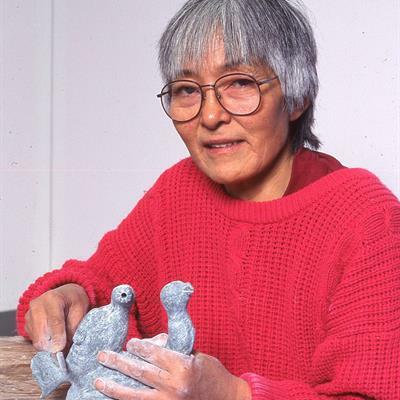 Very few of her carvings are depicted without discernible – albeit minimalist – facial expressions; of course the emotions behind those expressions are for the viewer to interpret as they will. There is an endearing quality to the figures that Maudie carves, and each piece is full of personality. The smooth lines, and fluidity are inspired, especially considering oftentimes Maudie herself doesn’t know what the carving will be or look like when she begins. It was in the 1980’s that Maudie perfected her own personal style, and her pieces are easily picked out from a crowd. Maudie’s work can be found in art galleries around the world, including the National Gallery of Canada, and right here at our own Galerie d’art Vincent.